The third ODI between Pakistan and Sri Lanka was one of those ODIs where everything went according to plan. It happens rarely for Pakistan but when it does it feels like there is no team better than them. The openers gave Pakistan a solid start. The middle order consolidated the platform. The late order accelerated and ended the innings on a high note. The new ball bowlers got early breakthroughs. The spinners choked the middle order. The fielders caught well. The wicketkeeper took some breathtaking catches. Everyone clicked. Everything worked. Pakistan won comprehensively. When they perform like this it makes you wonder why they can't do it more consistently. However, despite being notorious for playing like champions one day and like clowns the other, some semblance of consistency has definitely crept into this ODI team. Since the 3-0 drubbing at the hands of Bangladesh, Pakistan has played 6 ODIs - 3 vs Zimbabwe and 3 vs Sri Lanka. In 4 of the ODIs, Pakistan batted first and posted a total in excess of 280; in the other 2 ODIs, they successfully chased targets above 250 comfortably. Does anyone remember the last time Pakistan played 6 ODIs with this level of consistency? Does anyone remember how many times Pakistan posted a total above 280 in the 4 years they played under Misbah? Does anyone remember how many times Pakistan successfully chased a target above 250 under Misbah? In the 4 years between 2011 and 2015, while Misbah was captain of the ODI team, Pakistan batted first in 40 ODIs (barring ODIs vs Associates). In those 40 ODIs, Pakistan scored over 280 a mere 5 times. Moreover, Pakistan's average score in those 40 ODIs was 235. In the 4 years between 2011 and 2015, while Misbah was captain of the ODI team, Pakistan chased targets in 37 ODIs (barring ODIs vs Associates). In these 37 ODIs, Pakistan successfully chased a target of 250 or above only twice! So basically, what Pakistan achieved in 4 years and 77 ODIs under Misbah, is pretty much what Pakistan has managed to achieve in 4 months and 9 ODIs under Azhar Ali. What a joke! What a waste of 4 years. In 9 ODIs under Azhar Ali, whether batting first or second, Pakistan have failed to cross 250 only once. So what has changed for Pakistan? What are they doing differently now? What were they missing under Misbah? It is no secret that Misbah had a defensive mindset and Pakistan never adopted the modern approach to ODIs under him. Not losing wickets was the order of the day instead of trying to take risks and bat with a high run rate. Misbah himself never tried to play his natural game and instead built a game that focused on blocking endlessly and cutting loose only near the end of the innings and losing his wicket while doing so. The entire batting order played defensively and as a result Pakistan hardly scored enough runs to win ODIs. Misbah's approach to batting was so outdated that instead of progressing, Pakistan's ODI cricket actually regressed during his 4-year tenure, which ended with Pakistan languishing at number 8 in ODI rankings. Azhar Ali, on the other hand, started his ODI captaincy career by accepting the fact that ODI cricket can no longer be played the way Pakistan had been playing it for the past 4 years. He showed awareness of his own game and focused on improving his own strike rate and asking the same of his team mates. While Misbah mostly played at number 5 and blocked away his time at the crease, Azhar Ali took on the responsibility of opening the innings and taking charge from the get go. Misbah was happy blocking the ball back to the bowlers, Azhar Ali charges down and clubs the ball over the bowlers' heads. Talk about taking responsibility head on and leading from the front. While Misbah the batsman did alright as captain, it was never enough. He also pales in comparison to Azhar Ali the batsman in the short period that Azhar has been captain. Mohammad Hafeez is a key batsman in Pakistan's line up and he was key under Misbah as well. However, under Misbah, Hafeez was entrusted with playing the anchor role and his instructions were largely to keep one end intact. Not only did that curb the scoring rate but also denied Pakistan of aggressive starts considering that Hafeez either opens or plays at number 3. Under Azhar Ali however, Hafeez has shown more aggression. The change is apparent and it is quite visible that the instructions from the captain and the dressing room are quite different from what they used to be with Misbah in charge. The difference is highlighted by Hafeez' significantly higher strike rate under Azhar Ali as compared to under Misbah. Shoaib Malik is a player who suffered a lot under Misbah. He lost his touch around the same time that he lost his captaincy to Younis Khan in 2009, however under Misbah he was constantly in and out of the team and did not seem to have a permanent position in the batting order. Every time Malik would make a comeback to the team on the back of his prolific domestic form, Misbah would use him sparingly at 6 or 7. Malik was never able to translate his domestic form on the international stage and finally was out of favor with the selectors. Out of the 21 innings that Malik batted in under Misbah, 15 of them were at 6 or 7. It makes you wonder why you would use him there considering that he bats at 4 in domestic cricket and that majority of his international success has also come at numbers 3 and 4. The difference between his performance under Misbah and under Azhar Ali is drastic! Under Azhar, Malik has comfortably slotted at number 5 from where he has successfully finished games for Pakistan while chasing, and he has taken advantage of solid platforms and played aggressively to give Pakistan strong finishes while batting first. We finally have the Malik of the mid-2000s back. Unfortunately, Misbah never utilized him to his full potential. Haris Sohail made his debut under Misbah after several successful domestic seasons. He displayed his prowess soon enough, yet for some reason he too had to curb his natural aggressive instinct under Misbah. Just take a look at the drastic difference between his strike rates under the different captains he has played under thus far in his short career. Umar Akmal is another player who was wasted under Misbah. The junior Akmal played 67 ODIs under Misbah and batted in 59 of those. In 15 innings he batted at number 5, while in 35 innings he batted at number 6. Umar averaged 35 and had a strike rate of 86.6 under Misbah, which is similar to his career stats. He is one of the only 3 batsmen from Pakistan who average above 35 with a strike rate above 80 (other two being Saeed Anwar and Zaheer Abbas). Umar is by far the most talented batsman to come out of Pakistan in the past decade, yet today he finds himself out of the international scene. Under Misbah, he was used as merely a slogger, despite various requests from him to play up the order. A batsman with his ability and stats to match should have been playing at 3 or 4, yet Misbah continuously played him at 6 while persisting with the likes of Asad Shafiq and Younis Khan in the top order. Even Azhar Ali has been performing far better as captain than he did in his initial ODIs under Misbah. He had a pretty good average back then, but look at the difference in strike rates, which clearly highlights the changing mindset and approach. I will never understand Misbah's fascination with the likes of Asad Shafiq. It is obvious to everyone that Asad is an absolutely magnificent test batsmen, yet at the same time he is a total misfit and atrocious in ODIs. I never understood why Misbah persisted with him for so long and that too at number 3 or 4 while the likes of Azhar Ali, Fawad Alam, Umar Akmal, Sohaib Maqsood, and Mohammad Rizwan either warmed the benches or languished lower down the order. It really makes you wonder why Misbah never fought hard for Fawad Alam's inclusion the way he did for Asad Shafiq's. While Misbah has been a brilliant captain in tests and has even gone on to win more matches as test captain than any other captain in the history of Pakistan cricket, he was completely rubbish as an ODI captain. He has been the driving force behind Pakistan's rise to number 3 in the test rankings, while at the same time he has been the sole reason behind Pakistan's fall to number 8 in the ODI rankings. Not only did Misbah cramp Pakistan's batting in ODIs, he made the batsmen around him play defensively as well. It is the same players who are now flourishing under Azhar Ali, which goes to show what Pakistan has been missing in ODIs for 4 years. With Haris Sohail and Sohaib Maqsood out with injury and the likes of Sami Aslam and Babar Azam warming the benches, it augurs well for Pakistan's batting bench strength. The future looks bright, yet it could have looked this way had the PCB not sacked Afridi and replaced him with Misbah at the helm 4 years ago. Probably the biggest mistake ever in Pakistan's ODI history. This analysis is highly skewed. The stats used to backup the arguments are weak, at best. 1. Azhar has captained in just 9 matches, a very small sample size to draw any conclusions. 2. Of these 9, 3 were played in Pakistan where batting conditions are some of the best in the world. A third of the matches being played in such conditions skews this analysis even further. It's obvious that Pakistan's batting under Misbah would've done well at home too. Misbah captained in just one match at home (back in 2008) where Pak chased 320-odd to win against India. 3. 3 matches under Azhar were played in Bangladesh (Dhaka) of which Pakistan lost all and recorded their three lowest scores under Azhar. It can be argued these were the only matches where the opposition's bowling was threatening and the pitches were not complete batting paradises. In comparison, Misbah's team never lost a single match to Bangladesh. They recorded their highest chase in fact (329/7) in Dhaka, 2014. 4. 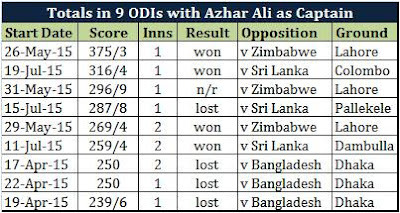 3 matches under Azhar have been played in Sri Lanka against arguably the weakest bowling attack ever from the home side. Never has Angelo Matthews been their most threatening bowler before this series. Malinga is nowhere near what he was. Playing just 2 specialist bowlers might be a first for Sri Lanka. The pitches have been flat too, as evidenced by Sri Lanka too chasing 280-odd, a target hardly achieved in Sri Lanka before. 5. The 3 matches in Sri Lanka have been played with new rules; no batting powerplay and no more limitations of having just 4 fielders outside the circle. This affects how teams bat, especially Pakistan who've always done poorly in preserving wickets in the batting powerplay, losing many matches that were setup nicely by Misbah and co from strong positions. 6. Azhar's team has different personnel from Misbah's. No Umar Akmal and Shahid Afridi in the middle/late order means a much more reliable lineup. No more collapses in the batting powerplay through dumb slogs, resulting in Pak underachieving in the final overs with too few wickets in hand. Rizwan, Sarfraz and Malik at the end are much more reliable and score just as quickly, if not quicker. The opening partnership has been good in almost all matches, mainly because Azhar himself is a good player. He was still finding his feet under Misbah as an ODI player but now he's matured and has the benefit of knowing he will not be dropped. That alone gives him more freedom to play his improvised strokes, which by the way he was also trying in India in 2013 but was unable to pull off because of the conditions. His failures in that series cost him his ODI spot. 7. Misbah's team had a poor top order: Shahzad opening with Hafeez mostly and sometimes Sharjeel. An in ODI decline YK or a Shafiq who could never settle at 3. Everyone can see Hafeez does poorly opening compared to his record at 3. Without Azhar in the lineup during most of Misbah's tenure, we had poor opening stands most of the time. An unsettled no.3 compounded the problems. Misbah usually batted at 4 or 5 and as the only reliable batsman, did more than his share to win Pakistan plenty of matches and save them blushes in others. Not his fault that he came in at 30-3 or 20-2 or whatever. Not his fault he had Akmal and Afridi, two who could barely use their heads, to follow him. Wednesday, July 22, 2015 This comment has been removed by the author. 8. Misbah's team played most of their matches in the UAE which has some of the least ODI batting friendly surfaces and outfields in the world. The average team scores for touring teams as well are much lower in UAE compared to elsewhere. Besides the surface at Sharjah (where fewer matches are played), teams rarely cross 280 or 300 in UAE. 250 is mostly beyond reach batting second, 230 is competitive. 9. Look at the Strike Rates of opposing batsmen who have toured UAE often. Sanga and Mahela languish well below their career SRs in matches played in the UAE since 2011. Sanga has played 10 matches for an average of 35.90 and SR of 65.75. Mahela figures are 36.50 and 64.31 respectively. It's not just Pakistan who've struggled to play 'modern ODI cricket' in UAE. 10. The stats of certain players under Azhar maybe better but that doesn't come down to a magical change in mindset or approach, rather the conditions in which those matches have been played and the weak opposition bowling. To draw conclusions about Misbah's or Azhar's approach from these stats is simply misleading. 11. Misbah's captaincy in ODIs was more attacking than Azhar's. A captain is judged on how he defends a sub-par score on the field and Misbah is far ahead of Azhar so far in this regard. His field placings and bowling changes during the WC were there for everyone to see and they were primary reason Pak made it to the QFs with a poor batting side, defeating SA, Zim and Ireland along the way. Several low scores were defended in UAE as well. Azhar hasn't yet managed to defend a target that was par or below par, against opposition that isn't even top class. It can be argued his captaincy was overly defensive and one of the main causes of defeat in the 2nd ODI in SL, also in Ban. 13. Pakistan were not the 8th ranked ODI side under Misbah. They were 6th mostly and got upto 5 for sometime as well. During the WC, their position fluctuated but I believe they ended up 6th again by the end. 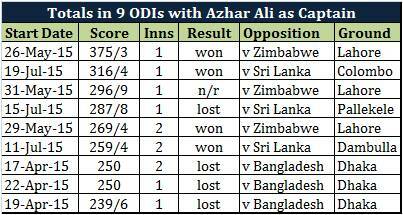 I maybe wrong but they were definitely not at no.9, the position they fell to under Azhar. 14. It can be argued that Misbah didn't play enough youngsters/new players in his team or if he did, he didn't play the right ones. Asad Shafiq playing and Rizwan sitting out is one example. Then again, he had to test out Asad Shafiq given he was put in the squad by the selectors repeatedly. Rizwan was never even selected in the squad. His exclusion of Fawad Alam is questionable, then again Fawad did misfire against Aus in UAE and found himself out in favour of Haris Sohail who took his opportunities. Malik got plenty of chances yet failed time and again. Can't blame Misbah for that. Malik has always been a flat track bully who's good against medium pace and spin, exactly what he's faced in Azhar's tenure. Under Misbah, he played in SA, Eng and UAE, not easy places to bat and against better bowling. Never got the runs he needed to get some confidence back. To conclude, only if one has a pre-conceived notion about Misbah as a captain and person can one put the improved batting performances down to his 'defensive mindset'. Facts suggest otherwise. Oh Gosh ! Spot on. Brilliantly written with facts and records,very welldone writer. Blind Misbah fans need to realize the damage misbah has done to the team during his time in ODIs .He was never an ODI (middle order) batsman to begin with .Using him as a middle order batsman from 2010 onwards was one of the biggest mistake our cricket thinktank ever made and making him an ODI captain was a blunder indeed.Misbah fans should put their egos aside and accept what's a fact as a FACT.As records and stats don't lie. I have got even more stats which show how outdated and dull misbah's approach was as ODI batsman.But you have posted enough of those to prove that he shouldn't have been made captain and even included in ODI side as a middle order batsman. I hope this piece of writing will help misbah fans understand his unfitnesses in ODIs and make them accept the reality. Thursday, July 23, 2015 This comment has been removed by the author. I think it's a great article. Thanks to share it with us. Really Misbah a great player & captain also. Someone think that he is little bit older...but it's not fact that he makes a good combination & inspired the members also. And the position in middle-order his batting is effective for his team. It makes to play positive cricket to other players..Almost he such a ideal player.